Zucchini bread was one of the first recipes I attempted last summer after trying to bake without using eggs, butter, white refined flour, or white highly processed sugar. It was a task I thought impossible at first, given growing up baking with those ingredients in every muffin, every cupcake, every bread, and every cake. So I searched the web to see what others had done to recreate this bread with a healthier ingredient list. I found this recipe below from the food blog, Hell Yeah It’s Vegan, which has since been taken offline otherwise I would gladly link you to it. You can find my slightly revised recipe below and her original recipe below that. Happy baking! 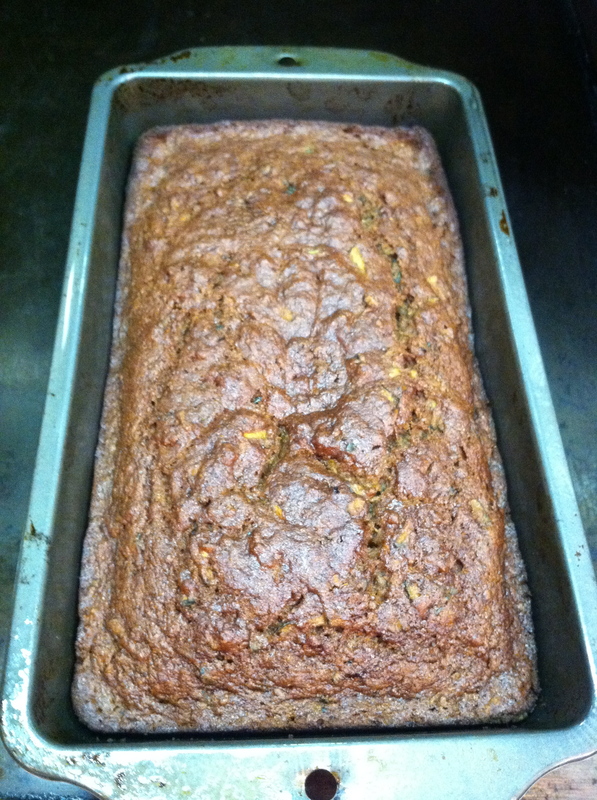 Zucchini bread just out of the oven. In one bowl, mix the whole wheat flour, brown sugar, cinnamon, nutmeg, baking soda, and baking powder. In a separate bowl, mix the oil, applesauce, vanilla, and grated zucchini. Once both mixtures are thoroughly stirred, add the dry mixture slowly to the wet mixture until well mixed. Then onto your additional add-ins. I didn’t put down a specific quantity for the chocolate chips or walnuts because I don’t usually measure myself. I generally just sprinkle in chopped walnuts and dark chocolate chips as desired. Finally, pour into sprayed or nonstick bread pans. Bake for about an hour to an hour and 15 minutes for bread. If you decide to turn this recipe into muffins, then you should bake for about 30 to 45 minutes. 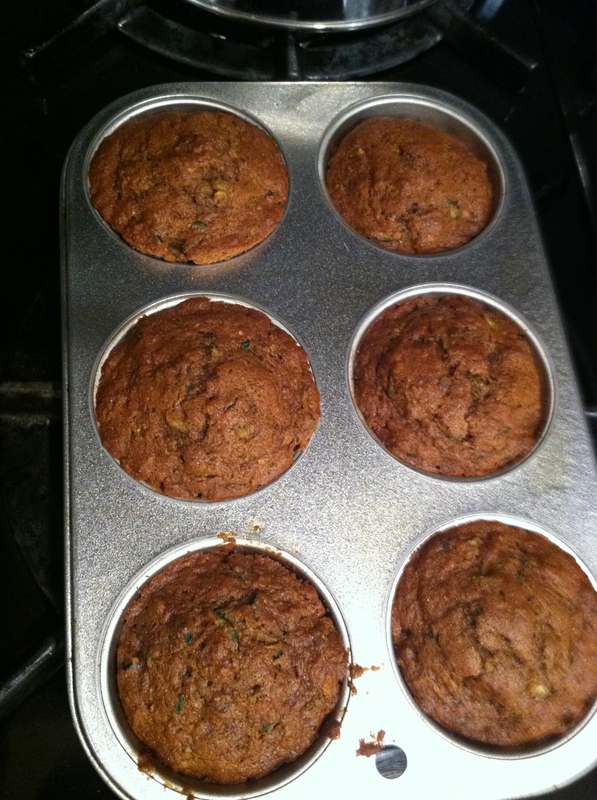 Zucchini muffins just out of the oven.